Claas DOMINATOR 40 TERRA TRAC. The cutterbar allows you to make full use of the potential of the DOMINATOR 40. 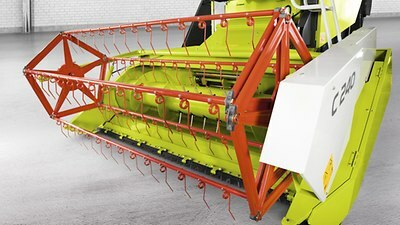 The twin knife drive and the reel ensure an even crop flow. Hardened edges on the intake auger, a slip clutch mechanism – every detail has been developed for challenging conditions. The four straw walkers work in perfect harmony with the threshing mechanism. Residual grain separation takes place over a length of 3300 mm. Large volumes of straw are transported rapidly and loosely. Proven CLAAS technology for impressive grain and straw quality. Comfort and practicality rolled into one: a single lever for controlling both movement and function of the machine ensures fatigue-free operation. 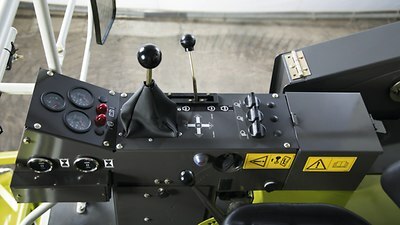 The ergonomic control panel with its display layout provides all relevant machine information. The 76 hp TATA engine impresses with its fuel efficiency, high reliability and extended service life. 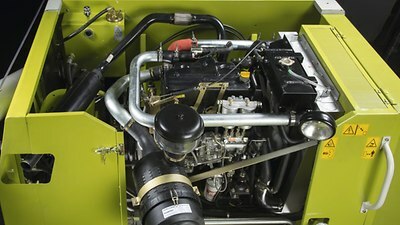 With its high torque, the engine is able to overcome even the most demanding harvest conditions. Maximum power. Maximum benefit.